At Budget Blinds of Lexington and Chapin, we're your local neighborhood experts that truly understand your needs. We're in your neighborhood, we know the local Lexington and Chapin weather and community, and we’re backed by the #1 provider of blinds, shades, and drapes in North America. Over 25 years of customer satisfaction gives you peace of mind that only comes with choosing the proven leader. We bring the showroom to you in Lexington and Chapin. We expertly measure your space, install beautiful window treatments, and back it up with the best warranty in the business so you can sit back and relax in the beautiful, Lexington and Chapin weather and sunshine. We serve to give you the best in window treatments, so you can rest easy knowing your space will be beautified and optimized with window treatments that fit your individual needs. Working with our customers from beginning to end is an experience we absolutely treasure and the look of satisfaction on a client’s face after an installation is our greatest reward! Welcome to Budget Blinds of Chapin, where our team of highly trained design experts puts a dazzling display of premium, yet affordable window fashions right at your fingertips. From the James Byrnes Expressway to Chapin Road, Irmo, and beyond, the team here makes your window fashion dreams a reality. That’s because we’re backed by the #1 provider of custom window coverings in North America, and we do it all for you. 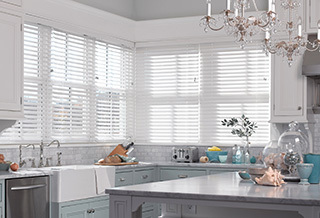 From versatile, stylish blinds and shades, to drapery in any style or fabric, and shutters that offer that artisan-like feel, Budget Blinds of Chapin has a style and smile for any budget. And to make the design process easy and fun, we bring our entire showroom to you. That means if you’re near Friarsgate Park another community in or near Chapin, we’ll help design stunning custom window fashions that finish off a room or an entire home…beautifully. So why not get started today with a family-owned, locally-based team that puts its heart and soul into showcasing windows just like yours. Click or call today and schedule your FREE in-home design consultation and see why more homeowners in the Chapin area count on Budget Blinds for window treatments that complement their home’s existing décor and brighten their day. Chris Petty is great to work with and will help you find what you want and need. Excellent customer service and communication from start to finish for our blinds order. Chris and Ryan were both very courteous and prompt at our appointments. Recommend you consider their service!! I recently called Budget Blinds for an estimate on new blinds throughout my home. Their pricing was incredible and the selections I had to choose from was very impressive to say the least. Chris and his employees did a quality install and were very professional. Thank you Budget Blinds!